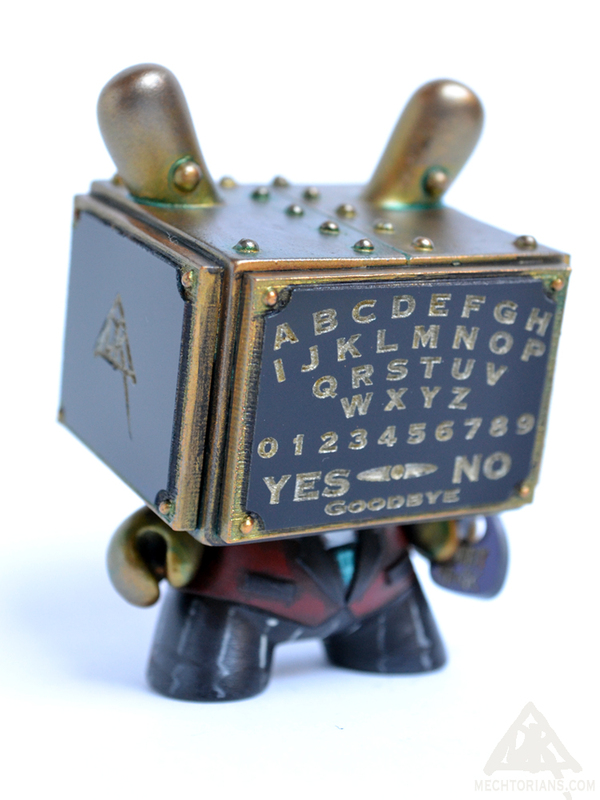 Customised “Tofu” Dunny vinyl toy from Kidrobot. 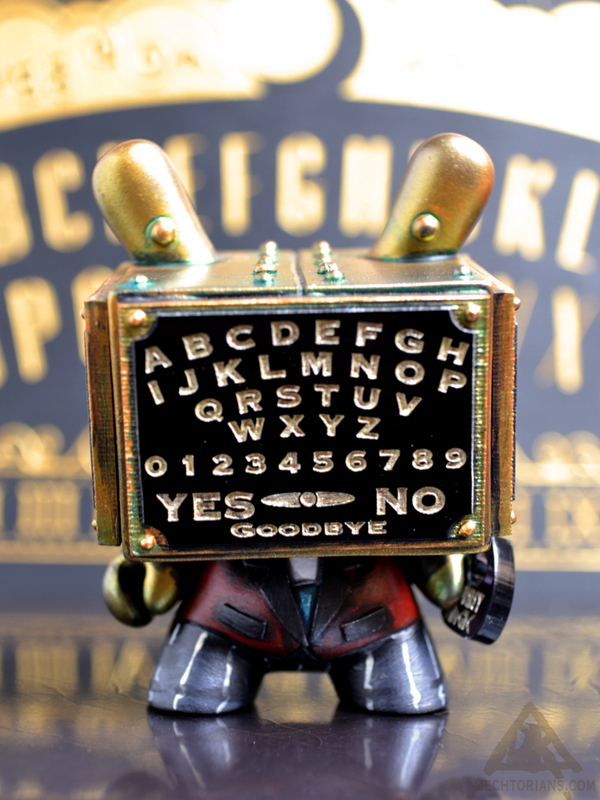 With removable key and Planchette. 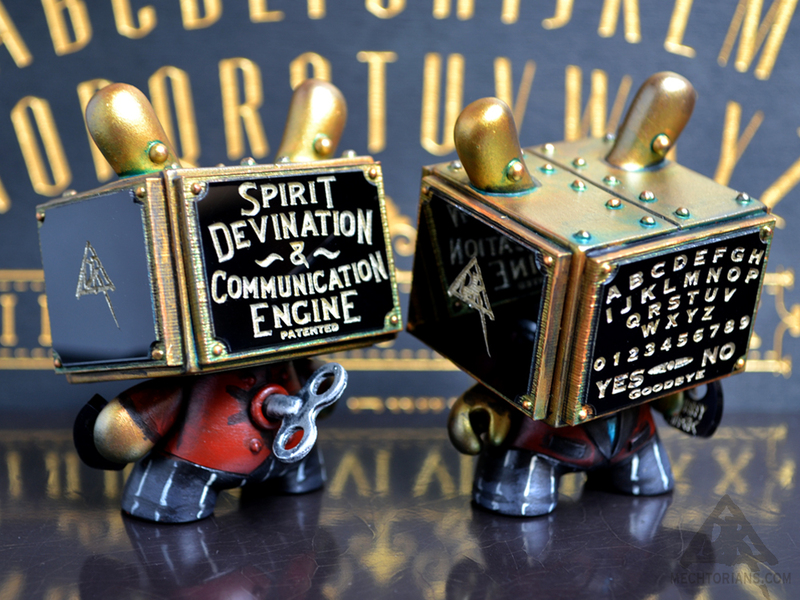 Edition of four hand customised Dunny toys. Each is signed, numbered and dated under the feet. 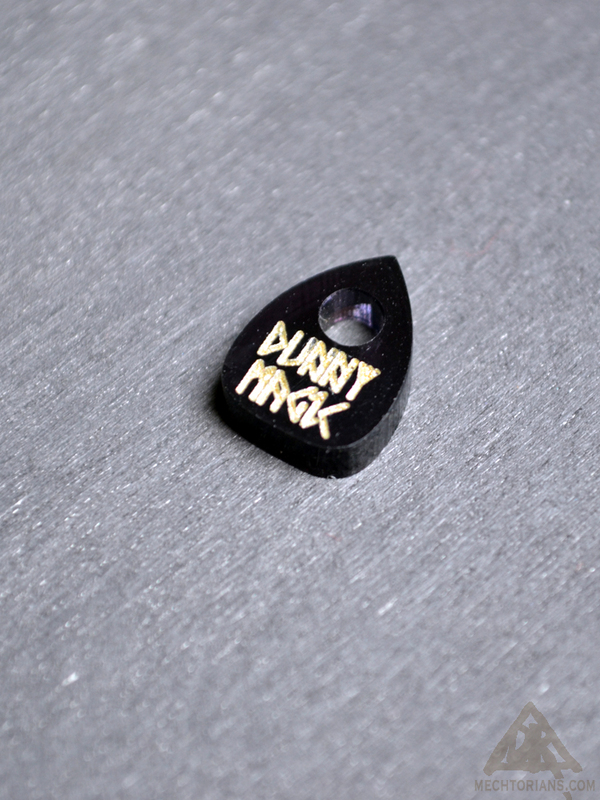 On sale from my online store on Saturday the 26th September at 8pm UK time. 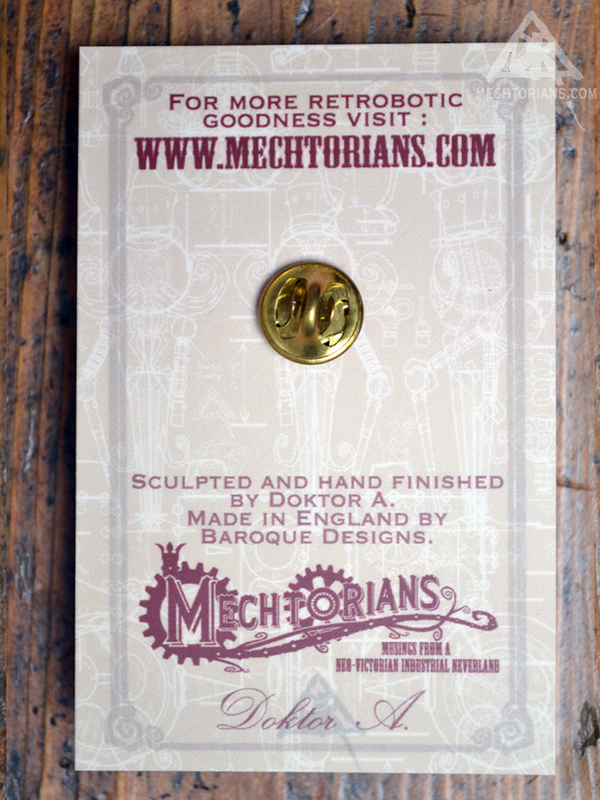 Fantastic “Cold Cast Metal” sculpted pin badges are now available from my online store. 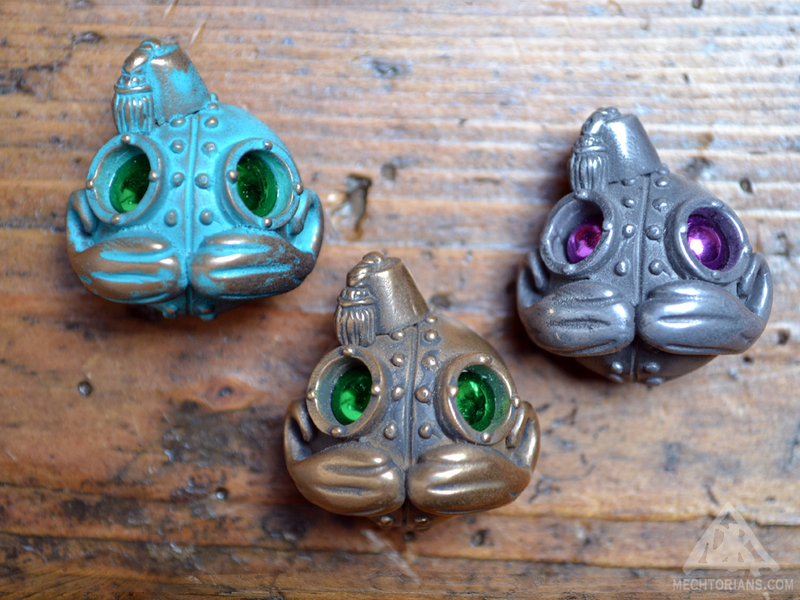 Each about 1″ across, these little resin Phizogs are great for your clothes,bags or collection cabinet. 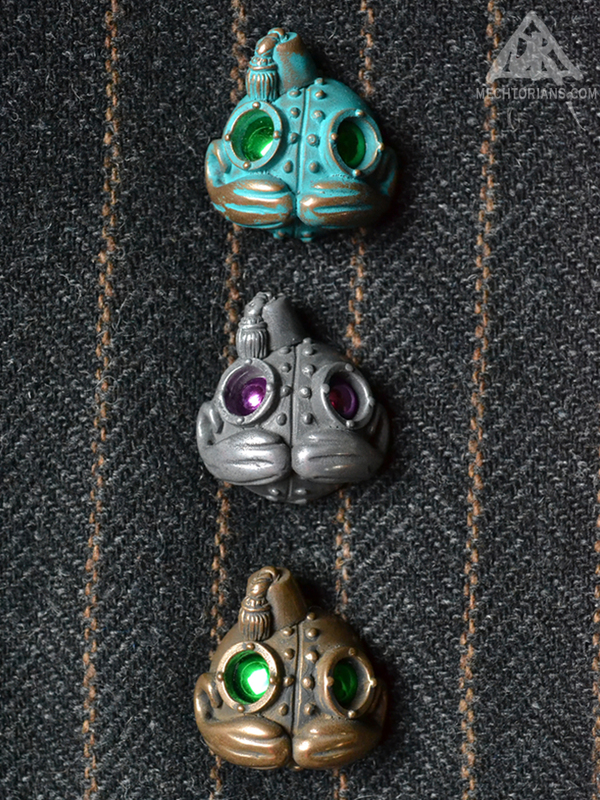 Tiny Mechtorian faces, sculpted by Doktor A and hand cast in England. 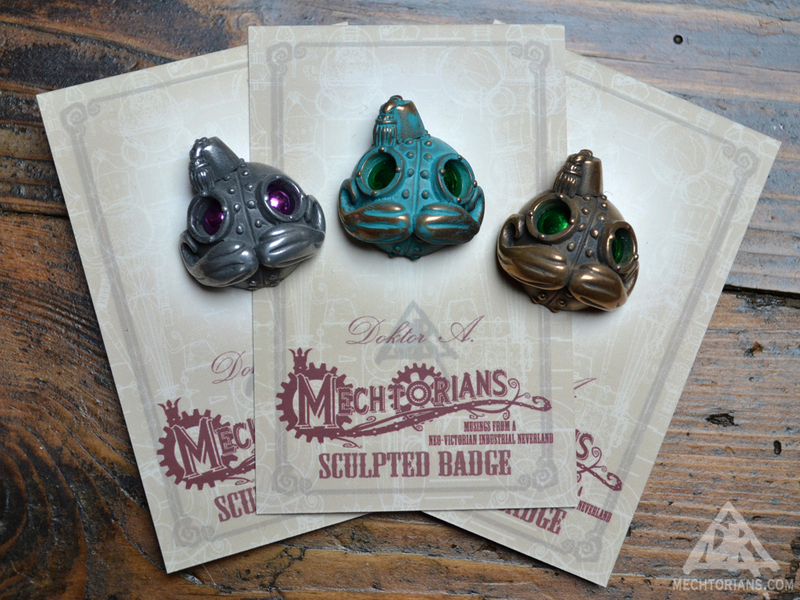 Each has inset mirrored metal eyes and individually antiqued and polished surfaces. 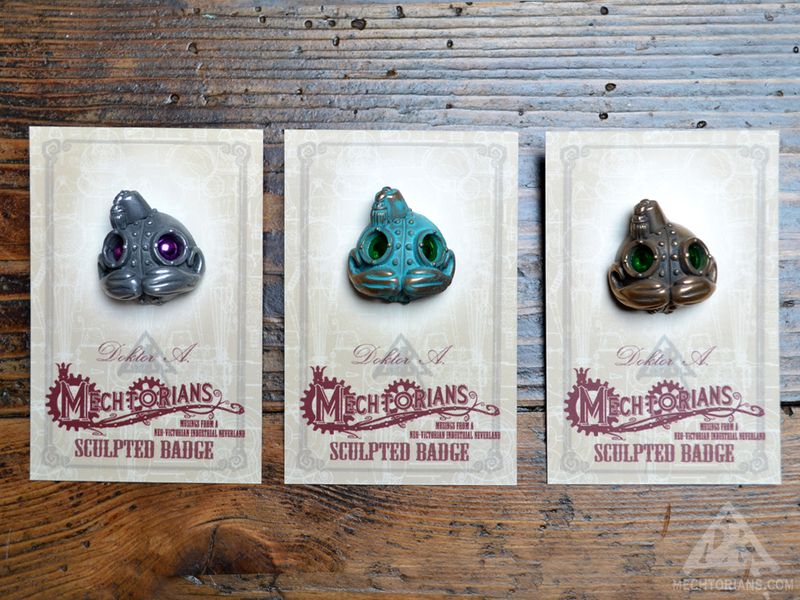 Three different “Metal” finishes are available. 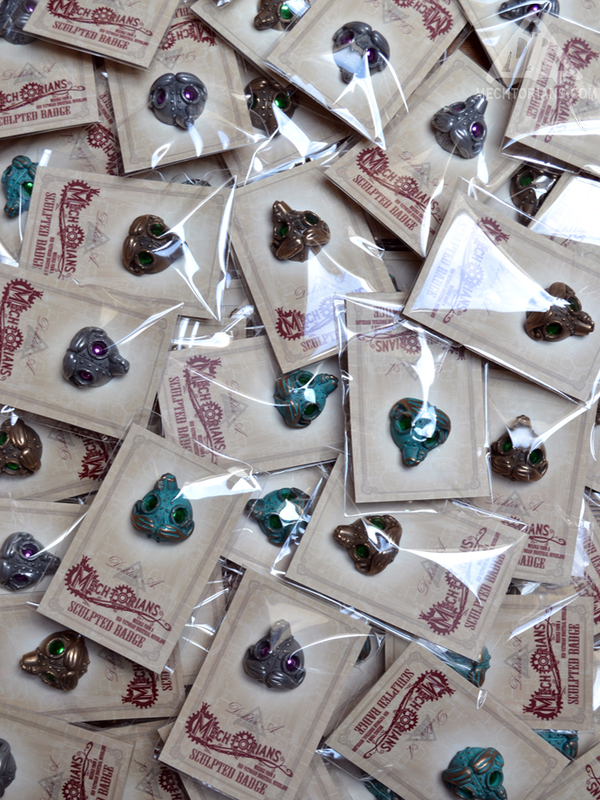 They come carded and bagged with a metal “butterfly” fastening and are only £10 each.. Welcome to Retropolis, home of the Mechtorians, a society of retrobotic characters from all walks of life. 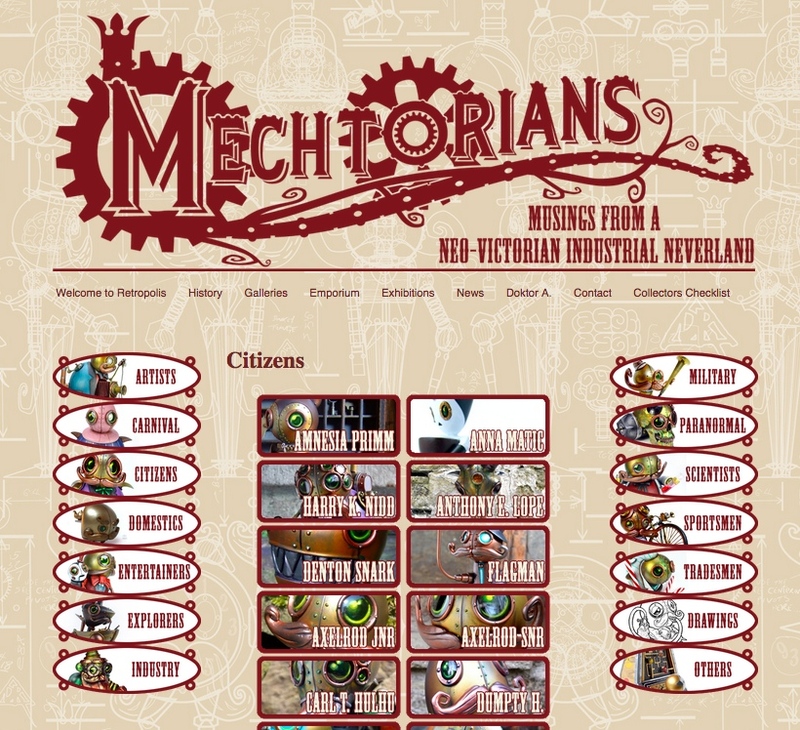 Welcome to the all new Mechtorians.com the online hub for all things Mechtorian. 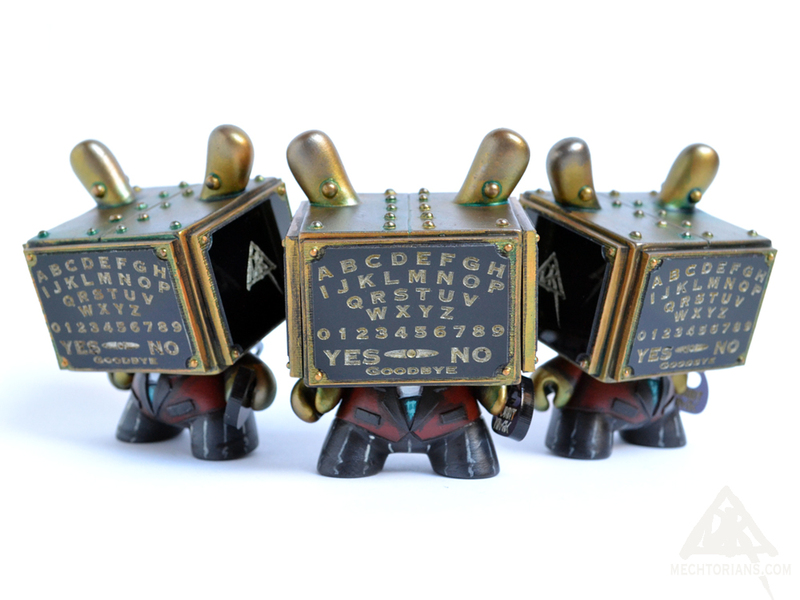 The new website collects together for the first time a decade’s worth of the Doktor’s Neo-Victorian robots. With over 200 characters listed it functions as a check-list and deep resource for collectors, an in depth introduction to the new-comer, and a splendid bit of eye candy for the casual visitor. 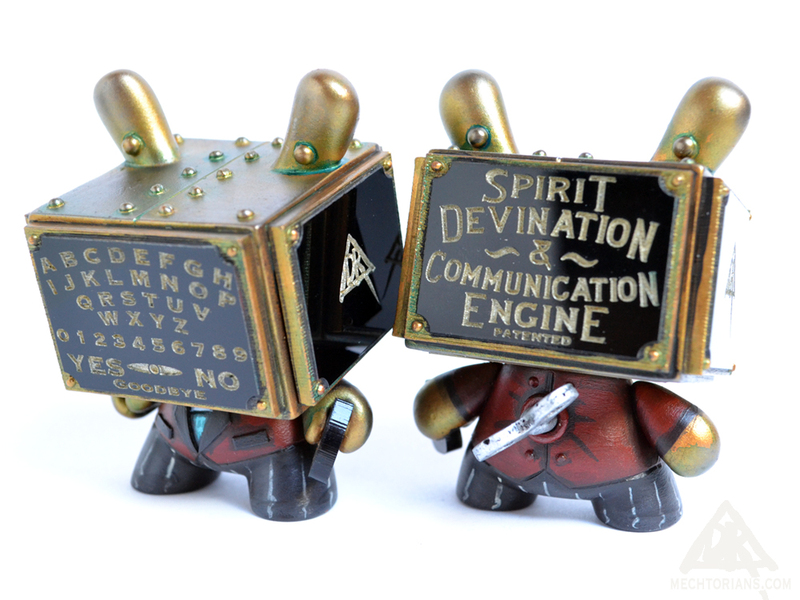 Sculptural pieces, drawings, paintings, small run toys and other items are all represented. With all new images, remastered from the original photographs, and a sleek new style, Mechtorians are presented in more detail than ever before. The first Mechtorian character appeared in 2006. 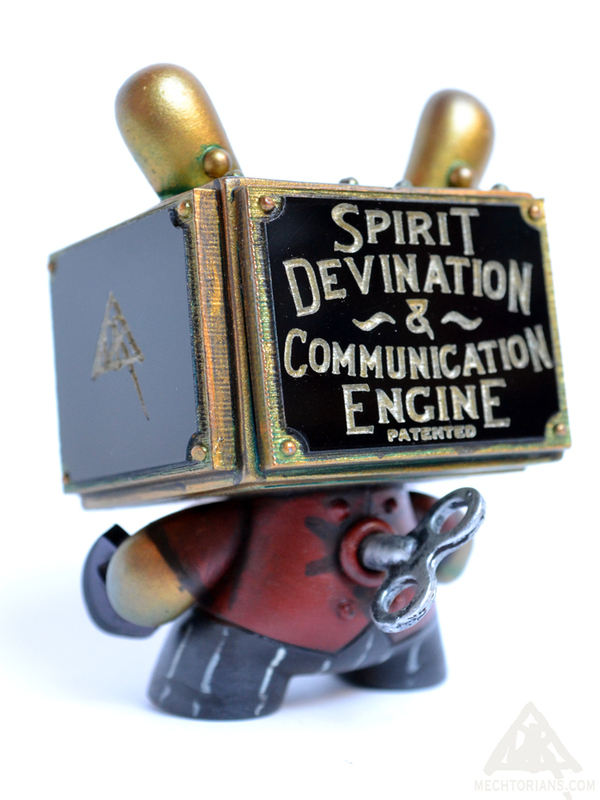 Since then over 300 different sculptural pieces have been created along with 20 different production toys (with a total of 88 variations), countless drawings and numerous pieces of related merchandise. Brass moustachioed scientists rub copper-plated elbows with polished metal bank managers, fairground hawkers and socialites in a fantastical realm where humans play no part. A world whose inhabitants go robotically about their daily routine, playing out their part in a society modeled on a flimsy memory of an ideal world. Every tone and level of life is here. From the extraordinary to the mundane. The mythos of the Mechtorians grows and deepens with the introduction of each new character. Their own story illuminating a small part in the ever widening, ever growing tale of the Mechtorians. Bruce Whistlecraft ( A.K.A Doktor A.) has exhibited for the last ten years in gallery shows set as far a field as Europe, America and Japan. The Doktor’s works have found homes in high profile private art collections around the world and new pieces are keenly anticipated. His characters have also reached a wider audience through the medium of toys. Short run collectible figures take on the role of three dimensional art prints, with more rare editions being highly sought after.